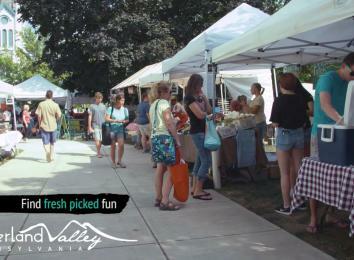 Cumberland Valley is the epicenter for fresh food and locally-grown farm products. With a strong agricultural heritage and an abundance of orchards and farm stands, you won't have to travel far to experience the beauty and bounty of each season. If you are looking for a place that is passionate about preserving the land and protecting natural beauty, you've found it. Cumberland County agriculture generates a total of $195.4 M in cash receipts from the sale of agricultural crops and livestock products according to 2012 PA Agricultural Statistics. There are approximately 1,400 farms of varying sizes in the County. Approximately 155,000 acres (or 44%) of the County are in agricultural use. Cumberland Valley’s agriculture industry provides opportunities for residents and visitors to obtain local fruits, vegetables and other farm fresh products through our farmers markets, farm stands, CSAs, and other retailers. Support a local economy and farms, keeping wealth within our region and creating jobs. Higher nutrient levels retained in food and fuller flavor due to the foods reaching you faster. Locally produced food is fresher than foods packed in trucks and shipped for several days. Buying local provides an opportunity to meet the farmer and learn how your food is grown.